‘Sant Sajan Bhaye Sarse’ are the lines from the 40th Pauri of Anand Saheb created by Shri Guru Amar Das Ji (Page 922 Shri Guru Granth Sahib Ji). In this Pauri, Guru Amar Das ji says that all pains, sorrows, and suffering disappear when a person achieves the state of ‘Anand’. Those who listen and recite Guru’s bani with love and devotion after relinquishing their ego, in total surrender to the Guru, experience the eternal bliss or Anand. Anad Sunho Vadbhaagiho Sagal Manorath Poore. Paarbrahm Prabh Paaya Utre Sagal Visoore. Dookh Rog Santaap Utre Suni Sachi Baani. Sant Saajan Bhaye Sarse Poore Gur Te Jaani. Sunte Puneet Kahte Pavitt Satgur Rahiya Bharpoore. Binvant Naanak Gur Charan Laagay Vaajay Anhad Toore. Prays Nanak, touching the Guru’s Feet, the unstruck sound current of the celestial bugles vibrates and resounds. Man Anad Bhayaa Milya Har Preetam ‘Sarse’ Sajan Sant Pyaare. My mind is in ecstasy; I have met my Beloved Lord. My beloved friends, the Saints, are delighted. Those who are united with the Primal Lord shall never be separated again. The Creator has united them with Himself. Hearing the Naam, the Name of the Lord, the mind is in bliss. Reaping the profit of the Naam, through the Guru’s Teachings, my soul has blossomed forth. Hao Jeevaa Hao Jeevaa Satgur Dekh Sarse Raam. I live, I live, and I blossom forth, beholding the True Guru. The Name of the Lord, the Name of the Lord, He has implanted within me; chanting the Name of the Lord, Har, Har, I blossom forth. Har Naam Vadayee Satgur Te Payi Sukh Satgur Dev Man Parse. I have obtained the glorious greatness of Name of the Lord from the True Guru; beholding the Divine True Guru, my mind is at peace. I live, I live, and I blossom forth, beholding the True Guru. Thanks Khalsa G, was sick of a sarsewala chella. 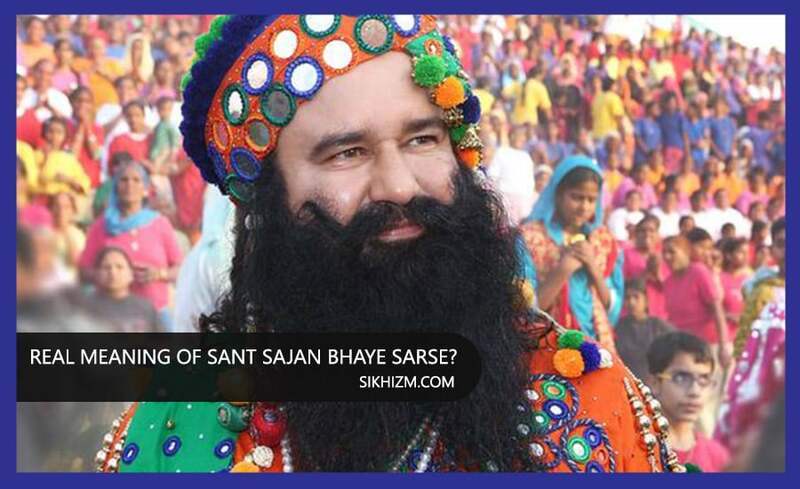 But now he is saying this website is crap, only his guru ram rahim knows what Bani means. I feel like these is competition going on be Kaun Banega Murkhpati between sarsa, radhe ma, nirmal and many more.